Almost a decade ago, when the original Gears of War was released on the Xbox 360, it was the first game on the console that truly felt like a "next-gen" experience. At that time, the visuals were unparalleled on any console, and even today the original version still looks pretty good. Nine years later, with the release of Gears of War: Ultimate Edition, the franchise barely shows any signs of aging, giving fans of the gory shooter exactly what they wanted and more. The Coalition has revamped the game completely with upgraded textures, resolution, and (in multiplayer) framerate. Even after spending countless hours back in 2006 with the original Gears, playing the Ultimate Edition felt surprisingly refreshing. 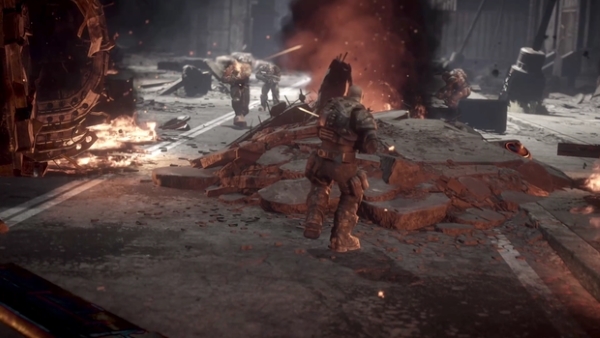 The campaign tells the story of the series' protagonists Marcus Fenix and his Delta Squad as they wage war against the Locust. This version of the game grafted features from the later games in the series and added others entirely new to the series. For example, during the co-op campaign, players can now randomly drop in and out of games instead of waiting for an invite. The Ultimate Edition also adds five more chapters previously exclusive to the PC version of the game. More notable, however, are the completely remade cutscenes that appear throughout the eight hour campaign. Unfortunately, issues that were present back then still haven't been resolved. AI remains an issue when playing alone. Dom, a member of Delta, takes the AI role when playing solo and there are times where he does silly things like run directly into groups of enemies and fail to pull levers which functionally halts the progression of the game. Other times Dom just stands around and does nothing. These AI issues aren't gamebreaking, but they do hamper the overall experience of a great campaign. I played multiplayer prior to the campaign and was spoiled by the 60 frames per second experience. I immediately noticed the difference between the two after starting the campaign, which runs at a disappointing 30 frames. That being said, it still runs smoothly and it's easy to overlook with all the other graphical upgrades. Like the campaign, the mulitplayer also benefits from this edition of the game in more ways than one. In addition to the framerate and resolution increase, new game modes like Team Deathmatch and King of the Hill make their debut. Previous maps that weren't on the Xbox 360 version have been added as well. Unfortunately, online problems from way back when still persist. Hit detection has always been a issue in the franchise as a whole; I was hoping to see this rectified with the addition of dedicated servers but somehow it still manages to be a frequent annoyance. Majority of firefights turn into shotgun-fests with each team hoping their shots register first. Other weapons, such as the lancer, hammer burst, and snub pistol are available but the lack of damage output makes them virtually ineffective the majority of the time. Objective-based game modes is where the multiplayer really stands out. The 20 maps featured in the game still feel as great as they did in the past and playing modes such as King of the Hill made me appreciate them more now than in the past. Despite the overall balance issues, the multiplayer still manages to keep its charm after all these years, resulting in some pretty gruesome and enjoyable matches. Despite its age, this remaster proves the franchise still has gas left in its tank. The game looks absolutely phenomenal and multiplayer is still as tense and enjoyable as it ever was. The Coalition has done a superb job of reminding us why we fell in love with Gears back in 2006. State of Decay: Year-One Survival Edition doesn't do much to standout from the original version of the game.